A Balinese woman hauls a piglet out of her market basket to show the little pig to prospective customers at a “wet” market in rural Bali. Asia’s wet markets are amazing places. It’s where most folks go to do their grocery shopping (“dry” markets are markets that sell clothes, household goods etc). They reflect the culture and economy of the country. Some, like the ones in Singapore, are neat and orderly, not much different, really, from grocery stores in the US. Thailand’s wet markets are sprawling, loud a little messy but not too bad. 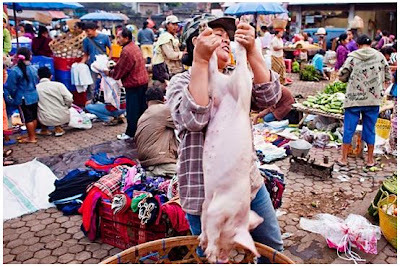 Laos’ wet markets will turn the most committed carnivore into a vegetarian. Animal parts sit on congealed blood while vendors swoosh away flies with plastic bags. Bali’s wet markets are closer to Laos than Thailand. Not quite as gritty as Laos but not as neat as Thailand. Fresh here means really fresh. Like still alive, take it home and kill it yourself.